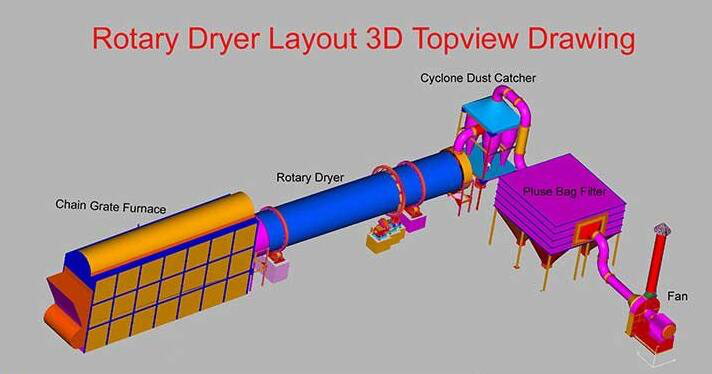 Product categories of Rotary Dryer, we are specialized manufacturers from China, Rotary Dryer, Manure Rotary Dryer suppliers/factory, wholesale high-quality products of Rotary Dryer Machine R & D and manufacturing, we have the perfect after-sales service and technical support. Look forward to your cooperation! Working Principle of Rotary Dryer: Material shall be dried to enter the dryer. When the dryer is rotating, a series of internal fins will lift the material by lining the inner wall of the dryer. When the material reaches certain height to roll the fins back, it will be fell back to the bottom of the dryer, then passing through the hot gas stream as it falls. This gas stream can either move toward the discharge end from the feed end (known as co-current flow), or toward the feed end from the discharge end (known as counter-current flow). The gas stream can be composed of a mixture of air and combustion gases from a burner, and in which case the dryer is known as a direct heated dryer. Alternatively, the gas stream may be made up of air or another (sometimes inert) gas that is preheated. When the gas stream is preheated by some means where burner combustion gases are not permitted to enter the dryer, the dryer shall be called an indirect-heated type. Indirect heated dryers are commonly used when product contamination becomes a concern. Read How Does HONGKE Rotary Dryer Work?